Another name for the valve back pressure regulator pressure in the evaporator." Its purpose is to maintain a constant pressure and, consequently, the constant of saturation temperature in the evaporator, regardless of the pressure changes elsewhere in the system. The example shown here, a self-contained, pressure-valve actuator. Pressure in the evaporator is the valve to the left and into the chamber, which surrounds the furs. When the pressure rises higher than the pressure of the spring bellows is compressed. 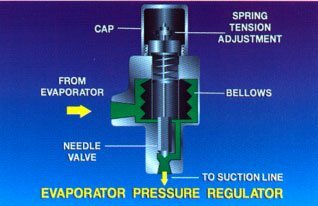 This raises the valve needle and permits REFRIGERANT gas liquids through the valve of the compressor. 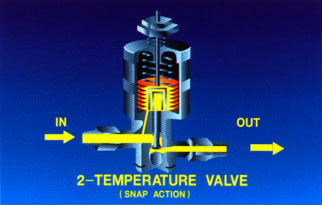 Until the pressure in the evaporator exceeds the spring pressure, the valve remains open. As evaporator pressure drops below the pressure spring bellows expands. This expansion pushes the needle back into the valve seat and stops the flow of refrigerant. Working pressure of the valve can be adjusted by removing the cover on top of the valve and suspenders (high pressure) or weakening of the (low pressure) spring-adjusting screw. This type of valve is useful when the minimum temperature of the evaporator must be insured. This is also necessary, when the system uses two or more evaporators, which must operate at different temperatures. Another type of check valve are often found in large systems is pilot-operated valve shown here. Although it works on the same principle as the valve discussed previously, the control point is not on the valve itself. Management pressure goes through the external connection management. As the pressure increases, it causes the pressure of the valve seat up from pilot port. This allows the movement of gas through pilot canal down to the surface of the piston. Gas creates enough pressure to lower the plunger and open the valve. 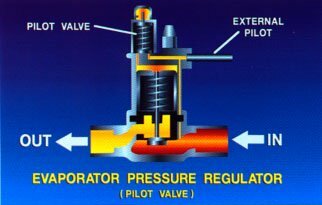 As pressure on the external pilot decreases, the pressure of the pilot adjusts the spring closes the valve and off pilot port. Gas pressure in the upper part of the piston, then bleeds through the hole in the piston and the main force of the spring piston upwards. This action closes the valve. Pressure to operate this valve can be taken from the evaporator, because this gives better performance than the suction line. The third type evaporator pressure regulator instantaneous or two-temperature valve. This valve operates on the same principle as the two valves of the previously discussed. However, the mechanical action is designed so that the valve is fully open or fully closed. Gas pressure in the evaporator flows through the body holes in furs. The increase in pressure leads bellows expand, which pushes the piston, a valve down and stood valve is open. This valve is used in two temperatures, where there are two or more evaporators operating on the same compressor. He always put in the suction line of high temperatures of the evaporator.